Successful gaming requires knowing and applying some secrets. It is vitally important to know something, which would be beneficial for everyone. It is just like table etiquette. You know just some slight aspects, but at the same time it means a lot. Roulette strategy secrets do not have anything complicated hidden inside. You should realize that there is no winning roulette strategy or system. It does not matter whether you apply Martingale or d’Alembert system. You will lose anyway. These systems are designed only for the even money bets (roulette bets), which gives you 50 percent of luck and 50 percent of loss opportunity. So, it seems that you are not betting a lot but still, sometimes you lose and sometimes you win. Everything becomes even, as there is the law of large numbers, which takes effect where the numbers are really large. It is next to impossible for the player to predict the winning number, it is all about guessing. Do not buy the “winning” strategies. They all are false and it is funny and sometimes sad that some people try to sell them for really good money. Well, honestly, there is one really worth roulette strategy. It is called bank roll management. 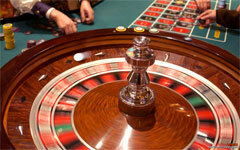 Some experts say that it is only a tip, not a real strategy of how to win at roulette. But it saves much money for the players. It develops discipline and strong will. Bankroll management offers to divide all your money (bankroll) you are going to spend today into the units or sets. It would be good if the units are small, but not really small and counted in cents. And bet these units throughout your gaming time. Never go over your bankroll. While playing, do not touch the hands of the dealer. First of all, it is mauvais ton. And if you do this, the dealer would not like you, while it is sometimes good to have someone on your side, if there is a complicated situation with the bets or winning. Tip the dealer. All American casinos welcome it while many European casinos ban it. Who knows who is right? The dealers do not have huge salaries and wages. It is the casino that takes all the cash. Always try to play European roulette (roulette table). The house edge is smaller there and your odds are way better than in American. Play online free roulette before you bet your real cash. It is handy and quite beneficial. You learn more and faster, as everything is happening fast in the casino. And you won’t be fooled anywhere. If you are going to the land casino, you can dress better than you are going to get some tan on a beach. Your outfit shows the staff your respect and they treat you better. They do not do that because you look like expensive James Bond but because you look nicer than other sweaty and smelly tourists. Check out if the casino you are going to is some kind of a club. It mostly concerns the European casinos. It would not be wonderful if you come to the casino, and you cannot enter is as you do not own a club card.